The Global Volcanism Program has no activity reports for Tutupaca. The Global Volcanism Program has no Weekly Reports available for Tutupaca. The Global Volcanism Program has no Bulletin Reports available for Tutupaca. Tutupaca consists of two dissected volcanic edifices, of which the southern appears more youthful. Collapse of the northern edifice produced a debris avalanche that traveled 7 km N. Postglacial lava flows are present, the largest of which originated from the saddle between the two edifices. Solfataric activity was noted in the Catalog of Active Volcanoes of the World. Based on morphological evidence, de Silva and Francis (1990) suggested that reported historical eruptions in the 18th and 19th centuries (listed in the Catalog of Active Volcanoes of the World) more likely originated from the more youthful-looking Yucamane volcano. Work by Samaniego et al. (2015) showed that activity in 1787-89 and 1802 CE originated at Tutupaca, and they considered the 1780, 1862, and 1902 reports to be valid as well. There is no Deformation History data available for Tutupaca. There is no Emissions History data available for Tutupaca. 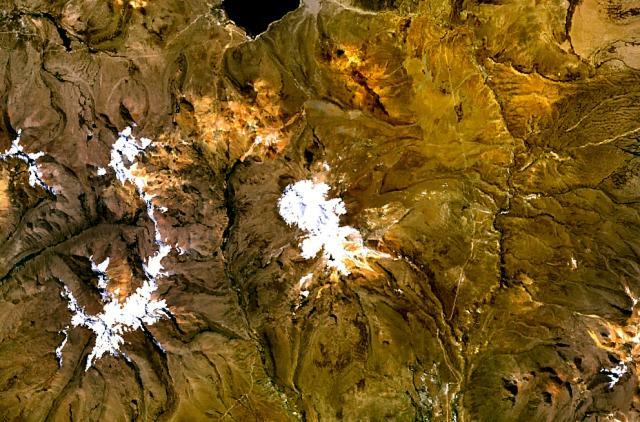 The snow-capped Tutupaca massif (center) consists of two dissected volcanic edifices, of which the southern appears more youthful. Collapse of the northern edifice produced a debris avalanche that traveled 7 km to the NE, forming the speckled area above and to the right of the summit massif. The canyon of the Río Tacalaya lies west (left) of the volcano. A sulfur mine is located on the SE flank of the massif and is accessible from the N-S-trending road west of the volcano. Laguna Huaitire is visible at the top left-center. There are no samples for Tutupaca in the Smithsonian's NMNH Department of Mineral Sciences Rock and Ore collection. Large Eruptions of Tutupaca Information about large Quaternary eruptions (VEI >= 4) is cataloged in the Large Magnitude Explosive Volcanic Eruptions (LaMEVE) database of the Volcano Global Risk Identification and Analysis Project (VOGRIPA).